Fed up with socks and sweaters? Can’t afford an i-phone? Below are a few ideas for gifts and stocking-fillers for the wine lover in your life. I’ve reviewed the fascinating range of Sakés from the innovative i-Saké in the past, so when they let me know they’d been working with master chocolatier Marc Demarquette, I guessed the results might be something special. 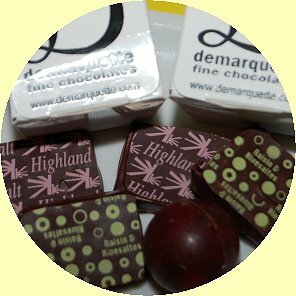 Marc sent me a selection of his ‘Saké Sugidama’ (£5 for a set of five) plus some other delicious and boozy flavours of his hand-made chocolates to try, including Rivesaltes & Raisin and Highland Malt. My god but this is seriously good stuff, and a must for all lovers of fine, very grown-up chocolate. Demarquette, 285 Fulham Road, London, also available through Fortnum & Mason. Fritz and Agnes Hasselbach run the neat cellars of Weingut Gunderloch in the middle of the town of Nackenheim, in Rheinhessen in Germany. I visited them last year, when amongst the superb Rieslings on offer were innovative 100ml bottles of dessert wine in these unique pyramid bottles sealed with wax. The packaging may be unusual, but the wine is superb, with honeyed white fruit on the nose, a weighty flood of intense, complex fruit on the palate and hints of exoticism as well as beautiful balancing acidity in the finish. 100ml is (just) enough for a couple of little glasses, and the retail price of £8.99 from Cooden Cellars won’t break the bank. Even the most devoted oenophile needs a break sometimes, so how about the ultimate gift for the whisky connoisseur? Ardbeg distillery on Islay has created just that with the ‘Double Barrel’ – a hand-stiched leather guncase crafted by Purdey guns, containing two single cask bottles of Ardbeg 1974, the oldest and rarest Ardbeg bottling, eight sterling silver Hamilton & Inches drinking cups, a bespoke oak and sterling silver Omas pen, a hand-stitched, leather-bound ‘Sampling Register’ and ‘Double Barrel’, a miscellany of Ardbeg single malt and shooting traditions. Only 250 of these sets exist and the price is a cool £10,000. Wine accessories abound at this time of year too, with shops full of glassware, corkscrews, wine chillers and the other paraphernalia of the wine buff. Arguably the best retailer of wine accessories in the country is The Wine Gift Centre, Wine gift items begin with stocking fillers starting from just 99p, including the Christmas drip-stops pictured left, and with a whole host of “mix ‘n match” 3-for-2 offers there are some terrific ideas here. Sainsbury’s have secured an allotment of 500 cases of Bolla Amarone della Valpolicella Classico 2004, which is in stores nationwide for £16.99 – though obviously in limited supply. Whilst Amarone – made from semi-dried grapes and, in this case, spending two years in both new casks and used French oak barrels – is really best when partnering game and red meats, there is something festive about it I always think. This example has a deep, crimson red colour and a nose that is intense and concentrated, with cherry skins and sweet, red berry fruit, and a little glimpse of something like kirsch or Parma violet. There’s a smoky, mocha coffee background that starts to emerge. On the palate this is very firm and concentrated, with a great core of tight, even rather severe fruit and acidity that is sinewy and dense. It does start to open on the mid-palate, but the tightness and graininess of the tannins, and the tightly-bound intensity of the fruit concentration means it stays very focused and linear into a long finish. This would drink really well with roasted duck, goose or game birds this festive season, though really it needs five more years in the cellar.